Managers are required to take leadership positions for the continuity of any organization. At some point, knowledge is taken as a given. Thereafter the management of self and people becomes the crucial factor to climb the corporate ladder. Creativity and innovation, strategy, vision, alignment, and gaining commitment through persuasion, are new skills required for success. This seismic shift requires a well thought-out plan to build leadership capabilities. With accelerated change in the environment, new behaviours and thought processes require a dual shift – change in self as well as in dealing with others. A proper assessment of the current state of potential leaders and clarity of what is expected makes way for a defined development plan to build leadership. Our philosophy is to enlighten our clients and realise the hidden potential that exists within them. Through a ‘carefrontational’ approach, we make sense of data in a 360° and other assessments such as MBTI or FIRO-B that may have been used. Maintaining individuality and confidentiality, we challenge our clients to see further and make forays into areas not treaded before. They learn more about themselves, affirm what was intuitively known and decide what the next steps will be. In organizational development processes, we work with companies to use a range of interventions such as action learning, group coaching, stretch assignments, simulations, projects and experiential learning to bring about lasting change. Our leadership development processes are closely linked to the challenges faced by the organization. As our motto suggests, Keep Discovering Your Potential, we work to ensure that the potential is harnessed for the organization while developing the self. In any form of leadership development, it is important to assess participants objectively about their behaviours and performance. There are an extraordinary number of instruments available in the market. However through experience and working with senior executives, some instruments stand out much above the rest. Myers-Brigg Type Indicator Step II (MBTI – to assess preferences based on Carl Jung’s theory), Fundamental Interpersonal Relationship Orientation – Behaviour (FIRO-B), BarOn EQi (to assess level of emotional intelligence), Change Style Indicator (CSI) and California Psychology Inventory (CPI 260) are some of the robust instruments (based on validity and reliability tests) that our consultants are certified to administer. [Google them for more information] They complement 360° feedback instruments such as Benchmarks® of CCL and Global Executive Leadership Inventory of INSEAD. Various instruments exist to assess a 360° feedback . SR Knowledge & People Consulting uses two robust instruments of leading organisations – Benchmarks® of CCL and Global Executive Leadership Inventory of INSEAD. Both instruments can be run online and the consultants working with us are capable of debriefing participants accordingly. 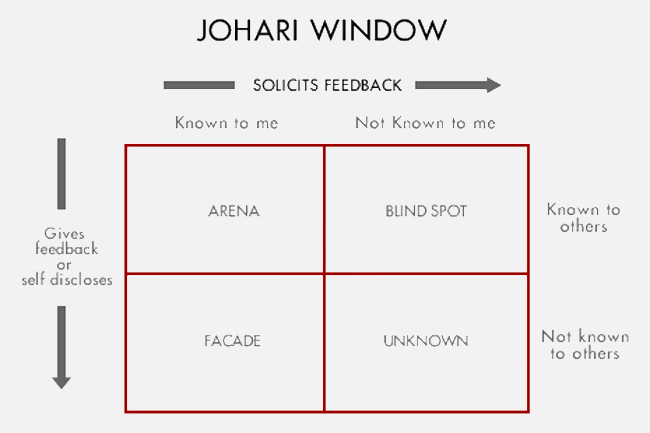 The Johari Window is an excellent frame to put a 360° into context. The objective of the matrix would be to enlarge the ARENA, thus creating better self awareness internally and of the environment.